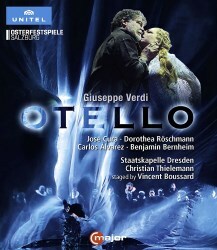 Verdi's Otello is well served on all media, including Blu-ray. A new recording has to justify its release, except to the people, who attended the original performances, in this case at the Salzburg Easter Festival 2016, so we need to consider what this has to offer. First and most definitely foremost is the Dresden State Orchestra, which has maintained its status as one of the world's best for a long time. I have admired several of their recent issues, directed by Christian Thielemann, so closing my eyes and simply listening to Verdi's masterly score was a very good option. Their associated chorus is also very fine here and I cannot seriously criticise any of the soloists either, though José Cura does sound under strain at times. Dorothea Röschmann and Carlos Álvarez are both on top form. The Salzburger Festspiele Kinderchor sound a little underpowered and also look rather uncertain, but their role is small. It must be said that Thielemann is not usually associated with Verdi; in my book he is more a Richard Strauss and, especially, a Bruckner man. This performance does nothing to assuage my doubts. This is a touch stately and whilst some moments are very powerful, there is none of the fire found from the likes of Karajan, Muti and of course Toscanini. In the end this is simply not exciting enough and only at the very end did one feel the emotional pull of one of Verdi's very finest scores. The attentive reader may have noticed that I closed my eyes for all this. If only they had remained shut! But this is a video and one has to look at the unhappy mish-mash of costumes and stage designs, directed overall by Vincent Boussard. He clearly has quite a lot of 'clever' ideas and, happily flying in the face of Verdi's music and Boito's libretto, he proceeds to inflict his 'Konzept' on us. There is early warning because the cannon shot in the opening storm is missing. At the top of a long list of disastrous choices is the set, because it is so big, featureless and flat and it keeps changing colour for no obvious reason. Then there is the additional character, a dark angel who keeps appearing to haunt not only Otello, but also to walk up and down a very, very long white table which slides on and off for much of the action. At one point it is covered in candles and one feared for her life if her black crumpled dress caught fire, not to mention her black wings. These last do actually burst into flame at one point and then belch much smoke. At the very end, for her final appearance to take Desdemona off stage, she has clearly been caught up in some dreadful conflagration because she is swathed in bandages. One assumes she is the angel of death or the black depths of Otello's tortured soul. By the way, nothing else about Otello is black, he is portrayed as a sort of outsider, according to the notes, and thus all racial undertones are side-stepped despite the libretto. He is not that much of an outsider, because he drinks tea like the rest of us, and is surrounded by people, who smoke filter cigarettes: both those who are in Elizabethan costume and those in 19th century grandee costume smoke cigarettes. Otello drops his saucer at one point and spends time sitting on the floor trying to put it back together. Don't ask, I have no idea. Desdemona dies and then stands up to be led out by the angel, who returns to listen, as Otello sings his fond farewell to the woman, who is no longer there and then gives him the sword with which to stab himself - a new angle on 'one last kiss', pressing a sword through one's heart. The list of inexplicable actions and curious staging decisions is long. I have seen strange Verdi productions before, but even the Macbeth in Leipzig, where the witches emerged from the dishwasher and the fridge of a 1960s kitchen, was at least lively and sometimes engaging. This Otello is a sad travesty and despite the presence of that wonderful orchestra I'd keep well away from it. The sound is good, as is the picture. The menu system is the usual mess where neither the individual acts, nor the sound, nor the subtitles are on the front screen. And of course we have a bit of Otello to serve as wallpaper while we search.